Make sure tank water is treated with de-chlorination products. Any pet can show aggression; be prepared and cautious at all times. It is illegal in many places to own an alligator without a permit. It is illegal in all states to release a pet alligator into the wild. If you're having difficulty with your alligator, contact your local wildlife authority for assistance. Use a different routine for getting ready to clean than you do for getting ready to feed, as your alligator will learn to recognize the cues for both, and you definitely don't want him to confuse the two. Thick rubber bands can be placed around the alligator's jaws to keep him from snapping while you tend to his needs. However, they have to be removed eventually. 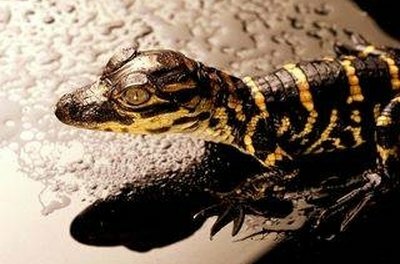 Baby alligators are much like the babies of any species: cute, little and seemingly helpless. Unable to resist temptation, every year people who have never before attempted reptile care end up purchasing baby alligators to raise at home. According to Crocodilian.com, alligators grow about one foot per year, reaching an adult length of 4 to 7 feet, and can live in captivity for more than 50 years. And although many people have successfully raised alligators as pets, alligator owners face a constant battle against 100 million years of evolutionary programming. Survival instincts cause alligators to view humans as a threat and possible dinner option. These are not low-maintenance pets. They are large, expensive, wild animals that require constant and diligent care. If you have truly thought it out and made the decision to purchase a baby alligator, the following guide can help you raise it. Choose the type of alligator you want. Generally speaking the Caimans are smaller, but more aggressive, while the American Alligator is tamer (but still an alligator) and larger. Dwarf breeds do exist, but that means a 5-foot gator instead of a 7-foot gator, which makes no significant difference in the size or quantity of equipment and care it will require. Create an enclosure for your alligator. A 12-inch alligator can be housed in a long 55-gallon reptile tank. Cover the bottom with large, natural rocks that have been boiled in a weak bleach-water solution. Create an "out of water" basking area taking up approximately one-third of the tank by stacking rocks on one end. Add water to the tank, enough for your alligator to totally submerge himself. Add en external filter designed for a 55-gallon tank. When your alligator outgrows this tank, you can use a child's wading pool filled with children's play sand that has been boiled in water for 10 minutes, drained and allowed to cool. Surround the pool with a thick layer of natural rock for basking and enclose it in a prefabricated chain-link dog kennel. Light your alligator tank with UV lights. Use the lights to mimic the seasons: Winter is 8 hours, spring is 12 hours, summer is 14 hours and autumn is 10 hours. Add ceramic-based heat lamps to keep the temperature of the water between 80 and 85 degrees and an air temperature of 90 to 95 degrees. An external water heater may also be necessary as the size of the tank grows. Clean the tank and completely change the tank water every two weeks. Rinse the rocks or sand on the bottom of the enclosure and remove any debris.